In 2002, filmmaker Gus Van Sant released one of his more polarizing and thoughtful films. In Gerry, two guys named Gerry (Casey Affleck and Matt Damon) hike ill-prepared into the desert to find themselves fighting for survival. A quick glance at The Sea of Trees suggests that perhaps Van Sant returned to these themes. Matthew McConaughey loses himself in a Japanese forest, befriends another wayward traveler (Ken Watanbe), their treacherous journey offering life lessons aplenty. Because horror writer Chris Sparling penned The Sea of Trees, I was kind of hoping the film would be a cross between Gerry and The Blair Witch Project. No, it’s an overtly sentimental, culturally patronizing waste of one Oscar winner and two Oscar nominees. 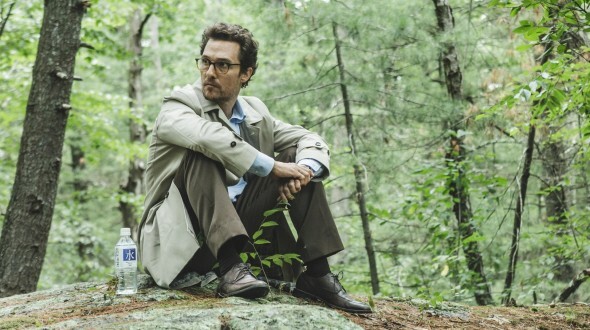 We wander Aokigahara, Japan’s “suicide forest,” with McConaughey’s Arthur Brennan. Brennan’s a scientist, and you know that that means. That’s right – atheist. Van Sant falls back on the crutch of the flashback to help us understand what this handsome scientist is doing in the suicide forest. It’s in these segments that we meet Naomi Watts’s Joan Brennan and begin to unravel the mystery behind Arthur’s trip into the woods. Watts suffers most from Sparling’s hackneyed dialog. Her few scenes need to be pivotal and weighty – we know this because of her utterly unrealistic speeches as well as Mason Bates’s condescending score. Van Sant is no stranger to schmaltz. As great a filmmaker as he has been, sentimentality tripped him up in Promised Land, Finding Forrester and others. His career is peppered with other writers’ projects, many of them with a point to make, and those statement films tend to be Van Sant’s weakest. Perhaps it’s because, rather than finding his own language for the story via camerawork or score, he relies on an existing style. The Sea of Trees certainly suffers from a heavy handed score. Van Sant also misses opportunities to create a sense of foreboding, claustrophobia, isolation or even redemption with the forest itself, Kasper Tuxen’s photography instead offering irrelevant yet lovely images of windblown treetops. Trees can definitely be sappy.